The evolution of a script is not something we all are privy to. Rarely do you get the treat of tracing a script through development. Diva is one that I've watched grow from little solo play at United Solo to flashy production at Theater for the New City. With book and characters by Sean Patrick Monahan and music and lyrics by Alexander Sage Oyen, Diva: Live From Hell is the quintessential show for musical theater lovers. Hopefully not inspired by a true story, Diva: Live From Hell let's the titular character, Desmond Channing, have a hell-ish cabaret as he recants the tale that sent him to hell. Taking on the key characters in the narrative, Desmond is destined to share his story with his Hell-mates, the audience. Desmond recants his time as a teenage diva when his life is turned upside down when a new kid, with a fabulous resume, intrudes on his drama club and their fall production of the public domain friendly The Pirates of Penzance. A tale of jealousy and revenge, Diva: Live From Hell is a musical for the theater kid at heart. Through the development of the piece, the structure of the show has evolved. Originally told as Desmond’s final story before his date with the electric chair, the first big change was the introduction of musical numbers. Written by Alexander Sage Oyen, the score fits Monahan’s world dreamily. With odes to the Golden Age, jazzy lounge numbers, and some exquisite showstoppers, Sage Oyen has brought new vivacity to Monahan’s colorful characters. If “How’s the Show” doesn’t get stuck in your head, you likely lack a pulse. The biggest change to Monahan’s story is Desmond is no longer waiting for death. He’s dead. He’s in hell and really has no clue why. His new “death” sentence is performing his greatest act in cabaret form for eternity. We’re granted the performance where he starts to break down for us. With a new location, the slightly new structure allowed for a more personal experience for Desmond where he literally gets to perform for an audience. There’s an inherent ability to interact, feeding off of the energy from the audience. With the content filled with insider jabs and recurring jokes, the cabaret environment is right for Desmond and Monahan. But no cabaret should ever begin without a musical number. Diva: Live From Hell did not, sadly. After a brief musical introduction and a telling sound cue, Desmond reluctantly walks on stage and spews out a monologue of disdain, spoiling why he was sent to hell. 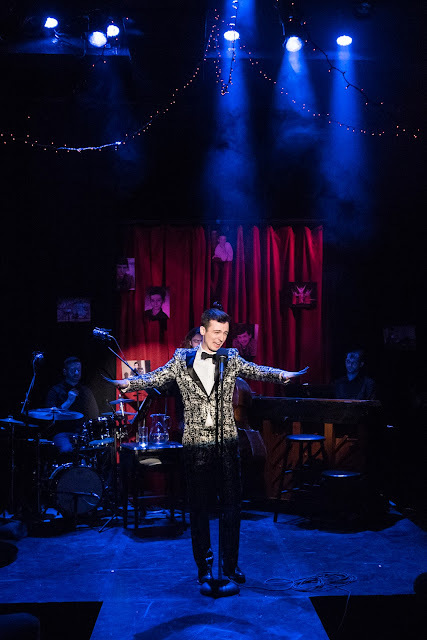 We learn that this is way deep into his performance run, outlasting even the longest running Broadway musicals, but the reality is that this is our first introduction to Desmond’s cabaret. The spoiler-heavy monologue virtually lowers the stakes within the story as we’re pretty much aware what he did to his rival, Evan Harris. Perhaps switching the order and giving less of a lead-in could be beneficial to the cabaret. That being said, the newfound hints of jealousy and denial that monologue throws in between Desmond and Evan builds that relationship exceedingly. The Desmond vs. Evan love and attention death match is truly one for the ages. This show would not be possible for the brilliance that is Sean Patrick Monahan. Both as a performer and writer, he has a strong ability to paint the players. They may be over the top but they are genuine and accessible. As a performer, Monahan is transformative. He has a magnetic allure that draws you into his world. Director Daniel Goldstein helped guide Monahan and his characters through hell and back. Goldstein kept the tempo snappy and the audience on their toes. Desmond is a naturally comical person but he doesn’t necessarily find his situation comical. And that’s where the humor shines. There’s a newfound moment of vulnerability for Desmond in his arc. And Goldstein has Desmond strip away to reveal his vulnerability. Literally. And it felt completely out of character. Rather than expose a new side of the character, you were left wondering why. With a lounge in hell, ambiance was integral. The scenic design from Dan Geggatt and Caitlyn Murphy was perfect for Desmond. This diva needed her stage and her runway and he got it. With headshots and photos through the ages, red string lights, and cabaret tables galore, the smoky lounge was elevated even further through the pristine lighting from Paige Seber. It all came down to color and the blues and reds worked wonders. Tyler Kieffer maintained the feeling of hell by incorporating the crackling embers at moments. Perfectly placed echoes helped Desmond transform into storytelling flashbacks but the school “bell” wanted to be a little more universal and less buzzy. Desmond would not be Desmond without the flashiest of flashy outfits. The shiny suit and bowtie matched the character. It was a great choice by costume designer Tilly Grimes. Diva: Live From Hell is a theater lover’s dream. If you find yourself asking if you have a little Desmond Channing in you, it’s totally ok. Just hopefully it’s not the psychopath part of him. The journey for Diva: Live From Hell is far from over. Desmond Channing has a lot more show in him.